SKU: n/a. Categories: Duo WIND, Duo WINDSUP. Together with the hardtail+inflatable Duo boards’ series, the DUO FUNCTIONAL RIG becomes the most versatile combination ever for your performance with very easy transport and hand carry. ….in very few minutes, inflate, rig-up an be out there! 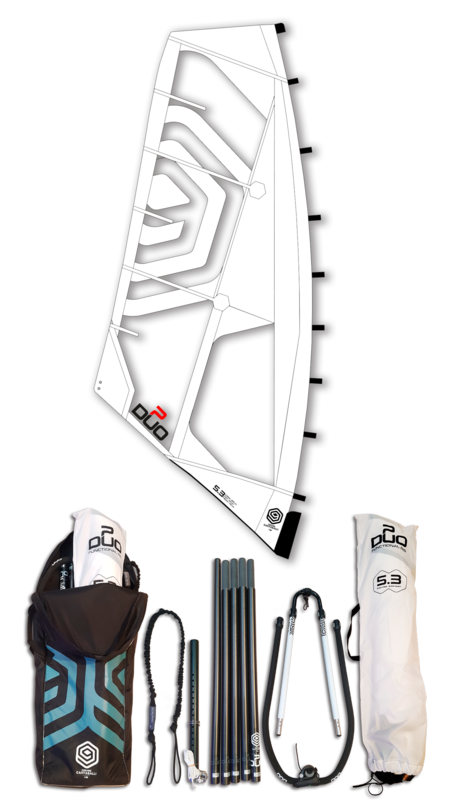 The DUO FUNCTIONAL RIG comes available with a sail choice of a 6.3m. or 5.3m. made of Dacron and clear Mono-film. The short-batten system helps the sail light-weight and to be incredibly very fast rigg & de-rigg, immediately foldable and stowed on to its designed compact backpack together with the rigg components. Our innovative MSS (mast-sleeveless-system) without the mast sleeve allow the DUO sail a super-light-feel and very easy handling on your water starting as well as standing up-haulling start-ups avoiding draining out water. – sail size (choise) 5.3m. or 6.3m.